I think we’ve seen the food hybrids run their course, so I decided to call these what they are. 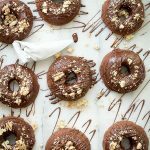 No weird Pinterest friendly name, just plain old chocolate brownie doughnuts. I thought about using Bro-nuts, It would have been interesting to see the search results for that one. I took a super reliable and delicious brownie recipe and baked it in a doughnut pan. I wish I could say there was more science behind it but nope, the results were dense and fudgy with crumbled cookies on top. This was only the second time I’ve made baked doughnuts and I have to admit, I’m from the fried camp. I’m not saying these were bad, nooooo not at all because remember, these are really wannabee doughnuts. Brownies shaped in circles, covered in a dark chocolate glaze and topped with cookie crumbs. Any cookie will do, there is no cookie on earth that would spoil these. Just for the record I used Trader Joe’s Iced Kona Cookies. I think every type of baked good needs some kind of sweet drizzle poured over it. For these it was just some dark chocolate melted and poured into a little makeshift parchment piping bag. You can be all neat if you like or just go at it like Jackson Pollock. No one will care, unless you didn’t make enough. 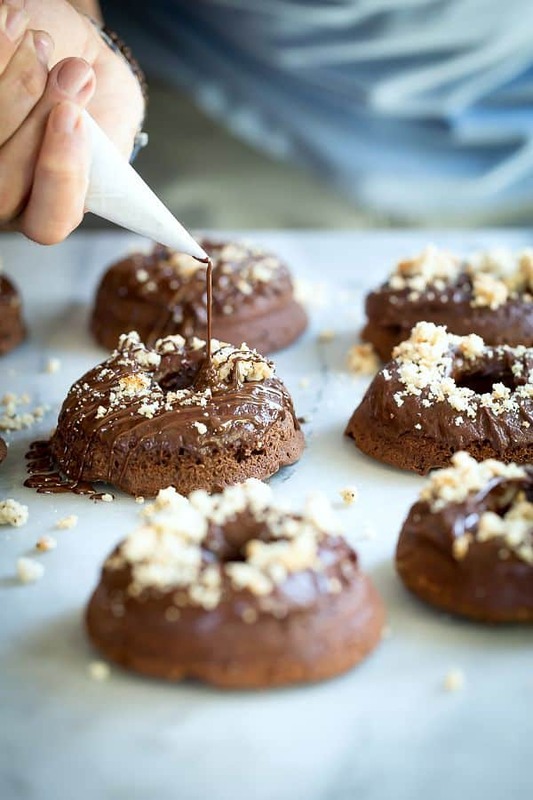 A brownie batter baked in a doughnut pan to give you moist and fudgy doughnuts. Top them with a dark chocolate glaze and crumbled cookies. Preheat the oven to 350 degrees F. Spray a doughnut pan with non-stick spray. Combine the flour and cocoa powder ina bowl and set aside. In a large pan, melt the butter over a low heat. Add both sugars and whisk into the chocolate mixture. Add one egg at a time whisking well after each addition. Gradually add the flour whisking until all of it has been incorporated into the brownie batter. Fill each doughnut pan spot with the batter about 3/4 full. Place in the oven and bake for 10-12 minutes and the surface springs back slightly when poked. Let cool before turning over the pan and slightly banging to loosen the doughnuts. Repeat with any leftover batter. Heat the heavy cream in a small pot until bubbles appear around the edges. Turn the heat to low and add 1 cup of chocolate chips to the cream. Stir with a spatula until the glaze is lump free and shiny. Dip each cooled doughnut rounded side in, to the glaze and let the excess drip off. Crumble the cookies and sprinkle on top of each doughnut. Melt the remaining 1/4 cup of chocolate chips in a heatproof bowl, using a microwave. 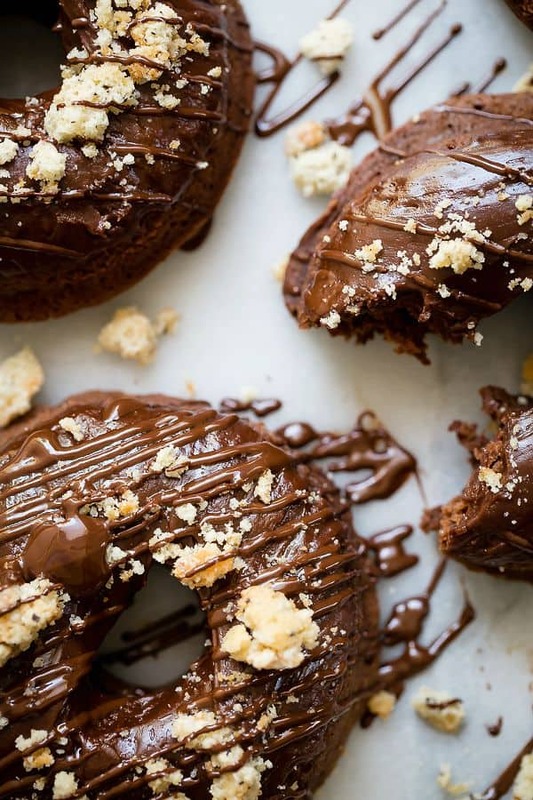 Drizzle the melted chocolate over each doughnut and serve at once. 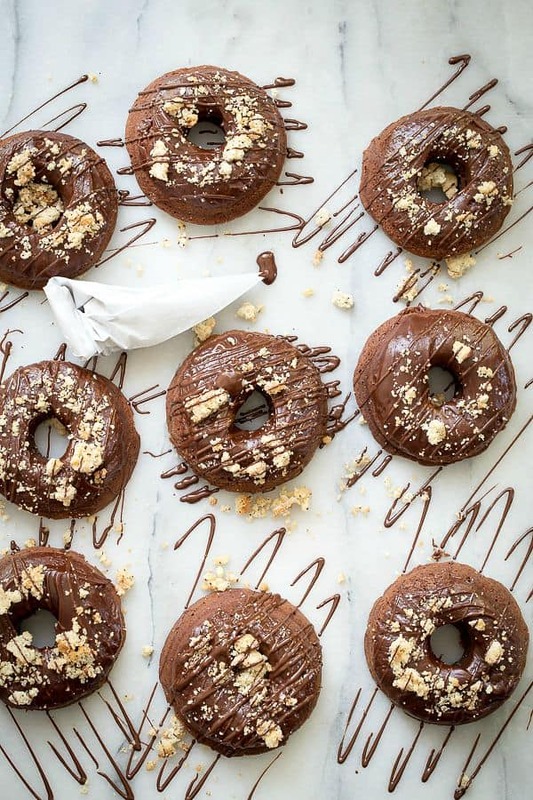 Brownie doughnuts?! I wish I could eat one right now. Pinning! I’m all about chocolate! These look amazing.